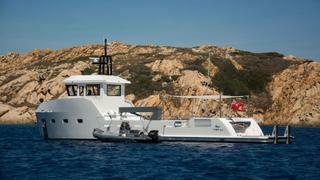 The 21.45 metre YXT 20 support vessel has been sold by Lynx Yachts and Fraser. Built in steel by Dutch yard Lynx Yachts, the design by Diana Yacht Yacht Design, is aimed at owners of yachts ranging in size from 30m to 70m who need a platform for water toys, crew and extra guests. Capable of multiple re-inventions, the yacht's design features a huge 45 square metre upper deck to store large tenders and toys, as well as serving as a beach club with a protective sun awning, sun pads and loungers with steps down to a wide swim platform. Aft, a pair of stern-mounted davit cranes can lift up to 1.54 tonnes each, reach up to five metres, and slew around 360 degrees, allowing tenders and jet skis to be easily loaded onto the vessel. For an added design flourish, the aft deck and first four metres of the main deck are finished in teak. Below, interiors are created by Frank Darnet and feature two twin crew cabins, both with en suite bathroom facilities, as well as 30 cubic metres of additional stowage space allowing for extra refrigeration, wine storage, or extra berths if required. The yacht's top speed is 15.5kn and she boasts a maximum cruising range of 900nm at 14.0kn with power coming from two 715.0hp Cummins QSM-11 diesel engines.